MERIT Website/MERIT Web portal address: http://merit.telangana.gov.in/Merit/Home/Index. MERIT Medical Education and Research in Telangana. MERIT Scheme has been launched in Telangana for the first time in our Country. MERIT is great opportunity for Medical Students and Professors. Registration and Submission through online mode only. 'Merit' for medical research. The state government has taken the initiative to conduct research in medical centers. There are no special funds allocated for medical research in any state in the country. This is the most dependable on the Indian Medical Research Council (ICMR). Telangana Government recently launched a new scheme titled as 'Medical Education and Research in Telangana (MERIT)'. Rs 12 crores for merit allocated in 2016-17 budgets. It has already released Rs 6 crore. Merit has been designed to serve all the services online. There are already 169 research proposals and Rs.2.5 crores have been distributed to the researchers/Investigators. 1. From the first year student to the PG students can use Merit for their research from assistants to professors. Can be researched into one or a group. As a group, anyone should make clear what the 'major research' is. 2. In Telangana, "Aarogyasri" has taken into consideration the possibility of any disease and encourage research in the selection of appropriate diseases. 3. The first type of investigations on malaria, dengue, gumia, typhoid and other diseases. Diabetes, high blood pressure, allergies, cancer, heart disease, kidney failure, and other research on other diseases. 4. The roadmap for road accidents is the third time the bones are broken. Others are interested in the interests of the students and the interests of society. 5. You will have to submit online details on what to do. How long? How many funds do you need? That's why it's useful. 6. The applicant sends the information to the experts. If they feel the right thing then the committee of values ​​will be forwarded. If there is an approval, the funds will be directly credited to the investigator's account. Each study has been decided to allocate Rs 5 lakh to Rs 10 lakh. 7. To facilitate research to faculty with the arrival of 'merit'. Through this, the digital library will be developed. Guest lectures with specialists, specialists in specialized medical departments and digitizing them. 8. The Directorate of Telangana Medical Education has already signed up with leading research institutions like CCLB and ICT. Now Merit will send students to their respective research institutions and get the necessary training.. MERIT was established in the year 2016 with an intention to enhance scientific research among medical fraternity of all the Government Medical Colleges of state of Telangana.Under MERIT, encouragement is given for medical research at all levels including the Undergraduates.MERIT also aims at national and international Collaborative research initiatives. In addition, MERIT would focus on an integrated teaching initiative for all the medical students of Government colleges of Telangana through advanced technology programs. Mission: To enhance the medical research perspective among the medical fraternity of Government medical Colleges of state of Telangana. To initiate and inculcate the research orientation from the level of medical Under graduation itself. To produce a quality medical research of national and international interest. Scope and Vision: To encourage the inherent research talent and ability of each and every student /faculty in Government medical colleges To achieve expertise and achieve breakthrough understanding in the locally prevalent ailments with the help of scientific research. To aim at collaboration with different organizations in the ladder of scientific excellence. Medical students have been doing MBBS course and have been able to continue research. The government has launched a special scheme to study the issues of study and interest. 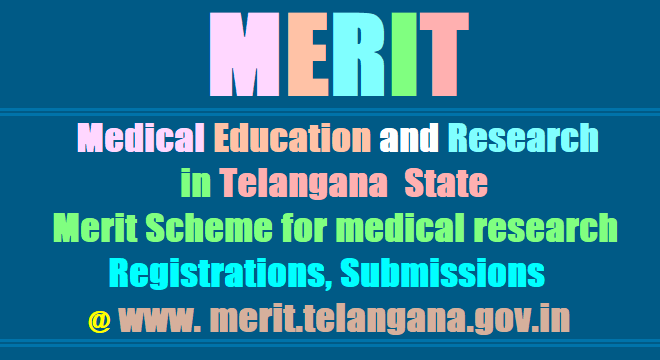 The scheme is being implemented in Telangana medical education research (merit). Last week, official website was also launched. Besides the MBBS and PG students, the Dental and AYUSH students, besides teaching professors, can also do research in this scheme. While some guidelines for research are prescribed. The research material that students or teaching professors should take is to be unique and unique. Why do they carry it? They have to explain what the benefits of the research are. Applications submitted with all the details are considered. They are sent to the Scratching Committee. Those who have the right qualifications will eventually approve. Subsequently, after the examination of the Ethical Committee, the student is allowed to conduct research. The government spends the entire cost of student research. The government has focused on quality education in medical education. Teaching professors do not lose students who do not have the right to college, and they will be able to send video records with specialized professors in the subjects of the 'Smart Studio' to the relevant colleges. Special training programs are planned for students in vacations as well. The number of colleges and applications available for the study are: Gandhi (76), Osmania (39), Osmania Dental (21), Kakatiya (13), Ayush (12), Nizamabad (8) Total (169).